Deutschland won the World Cup! Congratulations to the Germans, they deserved their impressive victory. This seems as good a time as any to do a spread on German art. The first two names that come to my mind when considering German art are Lucas Cranach the Elder and Albrecht Dürer. These are just the tip of the iceberg, but to highlight a visual culture we must start somewhere. Lucas Cranah the Elder (c. 1472-1553) studied painting under his father and eventually establsihed a successful workshop in the town of Wittenberg in Germany. Cranach’s son, Lucas Cranach the Younger, was also an artist, hence the need to distinguish. Cranach the Elder’s lucrative art business made him one of the richest citizens in town and he enjoyed the patronage of the Electors of Saxony, a State of the Holy Roman Empire. Additionally, the eventual spiritual turmoil of the times gave Cranach the opportunity to explore evolving views on biblical subject matter. He became close buddies with Martin Luther and later a visual propagandist for the Reformist cause. Click image to enlarge. 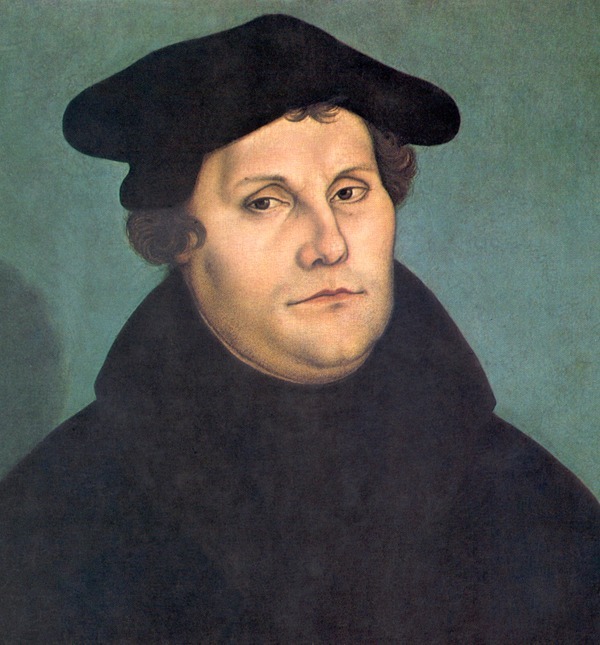 Lucas Cranach the Elder (German), Portrait of Martin Luther, 1529, oil on panel, 37 x 23 cm, Galleria degli Uffizi, Florence. The Reformation upheld law and the Gospel with great importance, placing extremely serious emphasis on redemption from sin. Enter The Last Judgement. We all know the gist of this subject. The Book of Revelation tells us that when the Son of God returns for his final judgement, he will sit upon a throne in front of all mankind and separate the righteous from the accursed. He will then save the righteous souls, shepherding them into Paradise and then cast the damned into Hell. Lucas Cranach the Elder’s Last Judgement illustrates the scene plainly, representing each realm in an oddly shaped composition that was probably once an altarpiece. Click image to enlarge. Lucas Cranach the Elder (German), The Last Judgement, c. 1525-30, oil on wood panel, 73.34 x 99.85 cm, The Nelson-Atkins Museum of Art, Kansas City. 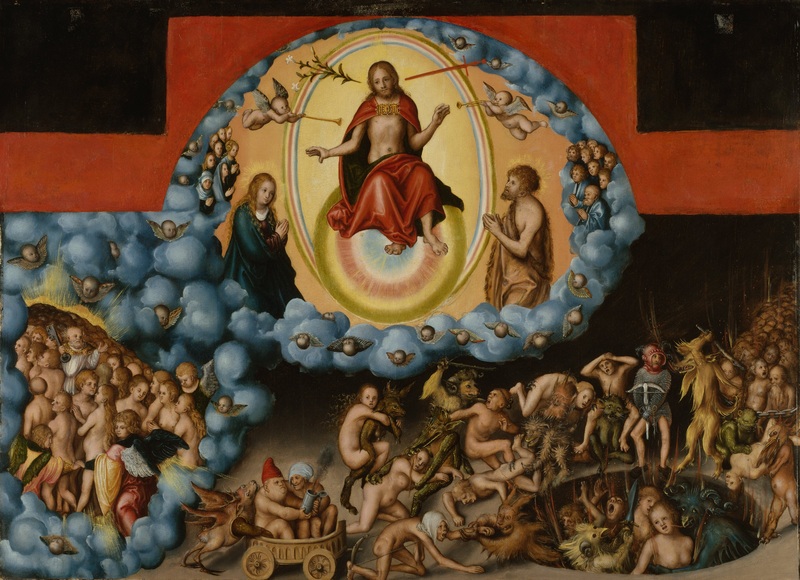 Cranach paints the highest level of Heaven in the top third of the composition, where Christ is upheld by an orb surrounded by angels and rainbows. Flanking both sides of Christ are saints Mary and John, their larger size indicating status as most holy. The lower halves of both saints’ legs are not visible, covered up by blue clouds as if this is just a windowed opening into their realm. Above Mary and John are two angels blowing horns to announce the final judgement. The sword next to Christ’s head symbolizes the sharp judgement he will issue to smite the nations of accursed souls, while the lily on the other side of his head symbolizes the peace and blessing that he will reward to the righteous souls. He gestures down to the queue of the Saved, showing them his favor. Click image to enlarge. 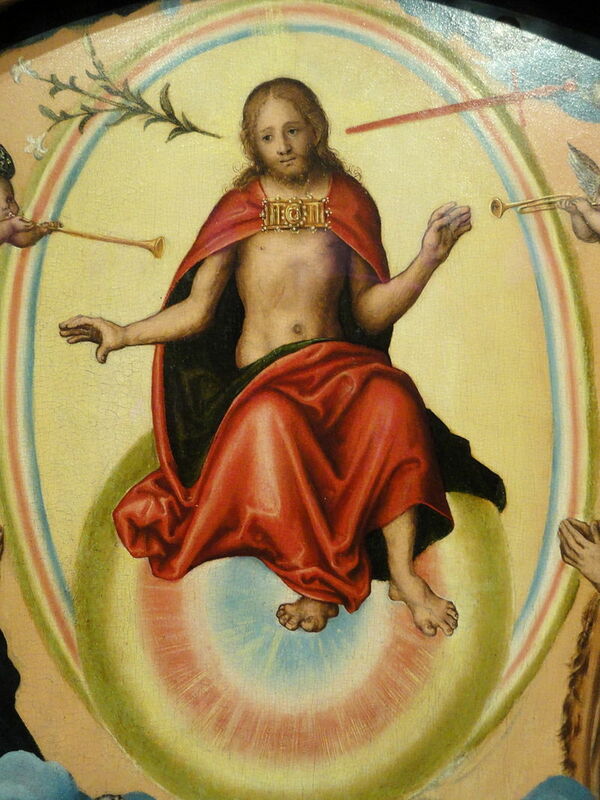 Lucas Cranach the Elder, The Last Judgement, detail. The line of the Saved is surrounded by clouds and ushered and protected by angels. Each naked person, having been purified, will be offered robes upon entering Heaven. They are guided by Saint Peter, the only figure in this group that stands out because of his white robes and his position facing the viewer. He holds up a gigantic key, his usual attribute as the holder of the keys to the gates of Heaven. 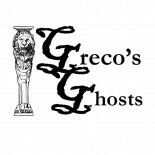 This group is smaller and more abbreviated than the group of damned souls at the bottom right third of the composition. Artists would often give more serious treatment to scenes of Hell, not only because of the shock value of traumatic images for the purpose of teaching moral lessons, but also for the potential of invention and creativity when creating metamorphic creatures as infernal monsters. The scene of punishment of the damned takes place in what appears to be a large and dark room, empty but for the demons dancing about enjoying the chance to torture some new prey. By depicting Hell as a mostly flat, immeasurable and bare space, Cranach is able to place more emphasis on its evil occupants and their actions within this environment. A queue of sinners processes into the bottom right foreground, approaching the group of devils as well as a circular pit in the floor into which they are thrown for their daily torture. Displaying an array of anguished expressions, the sinners are tormented by demons that appear to be fantastical composite animals, having the parts of different animals which traditionally represent evil. These imaginary bestiaries symbolic of evil are an old technique in iconography alluding to man’s inclination to sin. Moreover, Cranach alludes to the biblical description of Hell as an infernal abode of fire and sulfur with flames surrounding the damned which appear more like painful sharp objects than ignited, hot elements. 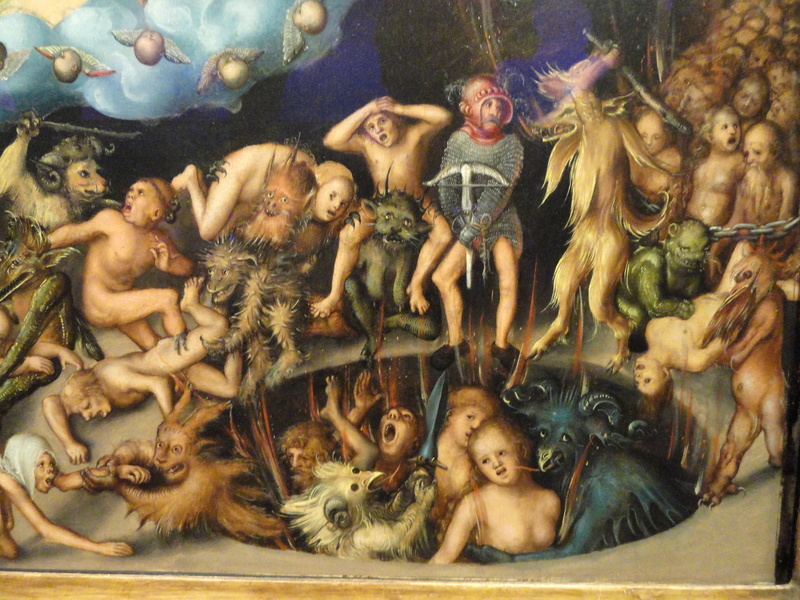 Cranach has another version of The Last Judgement in the Gemäldegalerie in Berlin, formerly attributed to Pieter Brueghel the Younger yet more a copy of Hieronymus Bosch. It is more elaborate, more fantastical in its composition, more experimental with light, and stylistically less like anything else in Cranach’s oeuvre. This one, painted at a later date, is more simple and more direct. The consequences of sine are on prominent display in the Kansas City painting. Using his talent for creativity, Cranach conveys the Protestant message of Redemption in a scene easily readable and able to instruct. This entry was posted on July 17, 2014 by KristyDurk in European, German, Renaissance, Sixteenth Century and tagged Albrecht Dürer, Deutschland, eschatology, German art, Heaven, Hell, Holy Roman Empire, John, Last Judgement, Lucas Cranach, Martin Luther, Mary, Northern Renaissance, Paradise, Peter, Protestant, redemption, Reformation, Renaissance, Revelations, Saxony, sin.